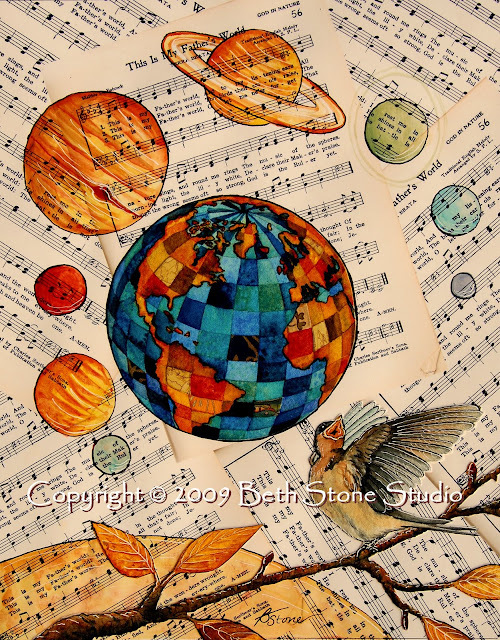 My original hymn collage, This Is My Father's World, will be one of the art pieces available in the silent auction at Mountain State Health Alliance's Spirit Gala: An Evening in Paris on January 30th at the Millennium Center in Johnson City, TN. This black-tie event is a benefit for the new Niswonger Children's Hospital at the Johnson City Medical Center. So, if you've got lots of money and want to benefit a worthy cause (and have a chance at winning this piece! ), be sure to order your tickets today! If you can't make it to the event (or don't win the original in the auction!) , I have prints of this collage (as well as others) available on my website! Click here to shop! Me: Hi! How are you today? Me: If you have any questions, I'm happy to answer them for you. These are all prints of my original artwork and photography. ELOPCD: (Pulling out a print - YES!) How much is this? Me: You'll need an 11"x14" frame for that. ELOPCD: (Pointing to the area inside the mat) What size is this part? ELOPCD: (Pointing to the mat) What's this part called? Me: That's called the matting. ELOPCD: I have a picture of my son that I cut too small - I need some of this matting so that it will fit in the frame. I guess I could take this out... (Pointing to my print! OUCH!) Could I do that? God has a sense of humor, doesn't He? Oddly enough, this was the same day this incident happened, so all in all, I think the two peanut butter cookies were well-justified. OK, I just clicked the link to the weird tree ladies. LOL I am also familiar with your deer in the headlights look. I took Bob Ross painting classes from a "Christian" lady. Only after several classes, it became obvious her idea of Christianity was merely 'spirituality' and she had a lot of really weird ideas. I loved the billboard. So cool! It's too bad they had to eliminate part of your artwork, because the whole thing worked together so well and the piece of it on the billboard misses so much of your beautiful work. But it's wonderful to have it displayed so prominently. I love the whole poster especially. Beth, congratulations on both of your recent accomplishments! God certainly won't let us get the big head! I just found you via Life As Mom's book list link, and I must say this post left me feeling sad for you as well as laughing because you seem to have taken it so well. Thanks for sharing a cute story; we all have to keep humble and God provides those moments to ensure that, hmm? Thanks for the empathy, Rebecca... just another day in the life of a starving artist. :o) I actually kind of enjoy the irony of moments like this - it's like looking at the stars and realizing we are actually very small. It's good to be able to laugh at yourself, and believe me, I get a lot of opportunities! Thanks so much for visiting my blog! Thanks for the laugh - even though I can most definitely feel for you too. When Dad and I did all of our craft fairs and shows some of the questions were unbelievable. But the stories and laugh that show up later are Great!! Congrads on your pic at the auction!